Can you tell us a little bit about your presence and strategy on Twitter? Jonathan: A few years ago we had two separate Twitter channels – one for Sky Betting and one for Sky Bet Help. We took the decision to merge the two channels in 2014, before removing @SkyBetHelp permanently in 2015. No one else in the industry was doing this at the time with their social engagement strategies though, so we faced a lot of push back internally. Ultimately, it was the right decision to make, and we can now provide a more streamlined engagement with higher response times. It also means the customer has direct and easy access to our team, and will receive a response from the channel they first contacted. How do you offer social customer service given that your customers are betting on games happening in time zones all over the world? Jonathan: We have flexible teams so we can ensure that when we have a big event in a different time zone that hits overnight, such as the Super Bowl or US Open tennis, we’re prepared to respond to any queries. Often, team members have specific expertise in a sport, so many will be up watching the game anyway. There are people for whom being part of the night team works well, we just make sure we plan well in advance so we know what levels of support we’re likely to need when. Our Social team currently works 7 days a week, 365 days a year. How does the type of customer support vary between social and traditional channels? Jonathan: Speed and immediacy are the two major strengths of the social channels; we don’t use them for the more detailed or in-depth conversations as it’s just not what customers want. When a query becomes more complex, we then migrate across to our more traditional channels. Our social media platforms act as a barometer for any bigger issues – we see things break through social then migrate through our other channels. What advice do you have for other social customer service teams? Jonathan: I learned very quickly to whittle down the number of channels we have across social platforms. For example, we don’t always need to give each specific product its own social channel. The idea is to streamline your presence so that customers aren’t confused about where to go for engagement and/or help. Liam: Push for your organization to treat social as a traditional support channel. For example, why not push for your social channels to be included in the Help and Support information on your website? With volumes of conversations growing exponentially over social platforms, it makes sense for companies to treat it as a formal method of communication and make it easier for customers to get in touch via social. Where do you see the future of social customer care going? Jonathan: The gambling industry as a whole is subject to regulations in terms of what social can be used for. For example, in the past, if we wanted to post something on Facebook, we would have to send the post to Facebook a week in advance for approval. We’ve come a long way in terms of what we are able to do now and I’m excited to continue to push the boundaries on our social customer care program, within reason. In the future, I see companies across all industries giving people not just customer service, but personal service. Social engagement teams will be communicating with a customer as though they are sitting right next to them. Everything will be about making the conversation personal and being able to manage the process at scale. Social will become infinitely easier, both in terms of internal processes, and for the customer. 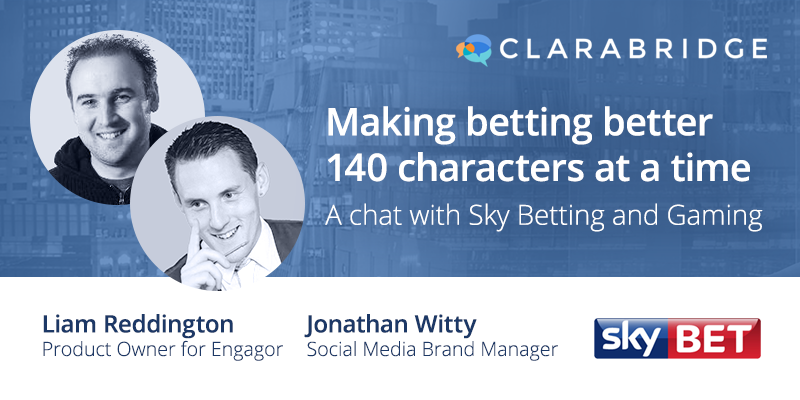 To learn more about Sky Betting and Gaming’s social engagement strategy, read their full case study here. With a background as a sports journalist with Press Association and Sky Sports, Jonathan joined Sky Betting & Gaming in 2010 and is responsible for the content and branding of all social channels across the business. The role requires a customer-first approach across the brand, content and customer service teams to ensure a consistent message on all social touch points. Liam Reddington has recently moved into the role of Product Owner for Engagor at Sky Betting and Gaming. With 9 years’ customer operations experience, Liam is now responsible for developing and maintaining the performance of the platform; the ultimate aim being to give customers the best social customer service and social engagement, while supporting the business’s operational needs. Serina Aswani is Manager of Content Marketing and EMEA Marketing at Clarabridge. As part of her responsibilities, Serina serves as the voice of Clarabridge’s customers, highlighting customer stories and sharing proven best practices for implementing successful Customer Experience Management programs. Serina also oversees content marketing strategy and PR for the Europe, Middle East, and Africa (EMEA) region. She is responsible for establishing Clarabridge’s position as an industry thought leader across EMEA. Serina holds a M.S. in Commerce, specializing in Marketing and Management, as well as a B.A in French and Studio Arts, from the University of Virginia. Read more from Serina on Twitter at @SerinaAswani.